26" x 35" A Special Limited Edition SERIGRAPH, signed/numbered original of 300. Published from a water colour and printed on 100% rag, acid free art paper. 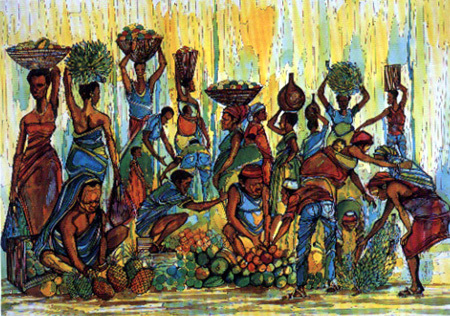 This work immortalizes a local village market set in rural Uganda. Evoking a tradition that predates the notion of monetary wealth, goods in abundance are exchanged for those more scarce. These interactions reinforce complex social bonds while they reaffirm one's relationship to the local community and its shared resources. A quintessential example of Kibuuka's fragmentation technique this scene is composed of geometric regions which recombine to form a cohesive unit. Splashes of primary color contrast with warmer hues, creating a vibrant foreground offset against the warm glow of a typical African day. The Barter has an embossed seal pressed over the artist's signature to certify the authenticity. A signed release for the 1992 collection, The Barter is no longer in circulation and its sequel, THE BARTER II sells in galleries for upwards of $3,000.